Diocletian stabilized the Roman Empire, introducing economic, administrative and social reforms. His actions laid the foundations for the division of the empire. Diocletian saved an empire collapsing under its own weight. He reformed the way the empire was administered by introducing the division of responsibilities amongst a tetrarchy. His reforms were often extreme and not always successful but ensured that for the twenty five years of his reign, the Roman Empire enjoyed renewed stability. Born in approximately 240AD, Diocletian began life as Diocles. His exact origins were obscure but certainly modest. Born near Salonae (modern Splitt) in Dalmatia, he may have been the freedman of a senator Anulinus. What is certain is that he rose through ability and commitment, becoming commander of the Emperor’s bodyguard. He was elected as emperor by the army in 284 after the murder of the existing imperial dynasty. Once emperor, he changed his name to Gaius Aurelius Valerius Diocletianus. His reign was autocratic. All had to prostrate themselves before him and refer to him as ‘Imperator’ or ‘Our Lord’. Despite this, Diocletian worked hard for the empire he inherited. Diocletian inherited an empire collapsing under its own weight. The early third century was marked by an increasingly dominant army. It became customary for legions to offer the empire to the highest bidder. Civil wars soon broke out amongst rival factions. This internal turmoil provided the perfect chance for opportunistic barbarians and client states to attack the empires’ frontiers. For the first ten years of his reign, Diocletian and his colleague Maximian were preoccupied with revolts in places as diverse as Gaul, Persia and Egypt as well as attacks from barbarian tribes such as the Alemanni and the Sarmatians. At the same time, it was necessary to reclaim Britain after it became part of the mini empire of Carausius. The revolts were brought under control and the empire stabilised by a series of reforms. Diocletian’s realised that the empire was too large for one man to manage. His answer was to divide the overall administration between two emperors or Augusti, one for the east and one for the west. Each Augustus would appoint a Caesar, a deputy who was also their effective heir. The Caesars and Augusti were mobile, moving wherever they were required rather than having a one set base. Diocletian himself used Nicomedia in Asia Minor, Sirmium near Belgrade and Trier in Germany, rather than Rome which was of diminishing importance. The result of this new system, known as a tetrarchy was that the frontiers were quickly brought back under control. The system was also supposed to prevent fighting over the succession, since the heirs were already nominated and in place. This worked, at least whilst Diocletian was emperor. The first tetrarchy was established in 294AD with Diocletian as the eastern Augustus with Galerius as his Caesar and Maximian Augustus of the west, with Constantius Chlorus, the father of the future Constantine I as Caesar. However, despite the division of power, Diocletian remained in overall control. In addition to dividing overall control of the empire, Diocletian subdivided the empire into 13 large units or dioceses each governed by a vicarious, a substitute or proxy administrator for the emperor Only the provinces of Achaea, Asia and Africa remained under proconsular control. Diocletian’s also separated military administration from civil. As emperor, he ensured that he had direct control of the army. Diocletian’s economic reforms were less successful. By the time of his reign, the coinage of the empire was so debased it was basically worthless. Diocletian attempted to rescue it, by re issuing new coins. However, there was not enough gold and silver available to support it. As a compromise, Diocletian then reformed the tax system, allowing payment in kind rather than money. As part of his long term rescue plan for the empire, Diocletian drew up a list of occupations essential to the strength of the empire. Soldiers, farmers, civic officials fell into this list. To ensure that these professions were always well manned, Diocletian made them hereditary, effectively inhibiting social mobility. A religious conservative, Diocletian was devoted to the old ways. He instigated a series of measures that became known historically as the ‘Great Persecutions’, forcing Christians to sacrifice to the old gods. This was despite the fact that his wife Prisca and daughter Valeria were reputed to be at the very least Christian sympathisers. In 303, Diocletian celebrated 20 years in power with his first visit to Rome. However, the following year, he fell seriously ill and took the unprecedented decision to stand down as emperor. 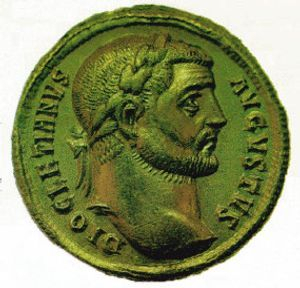 Forcing Maximian to do the same, Galerius and Constantius Chlorus became Augusti, appointing new Caesars in their turn. Diocletian retired to a magnificent palace he built in his hometown. Retirement suited him and he did not miss power. He resisted a recall to power in 308AD, despite the disintegration of his system of tetrarchy, with the words ‘if you could see at Salonae the cabbages raised by our hands, you surely would never judge that a temptation.’ He died in 313 AD.